line more than triples the capacity of the previous model. 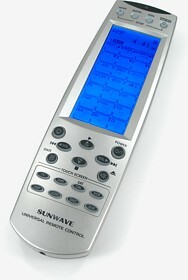 Take a close look at the Sunwave universal remote control pictured on the left. 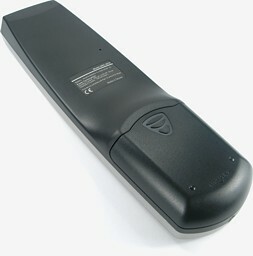 Although you may not know the brand name, avid readers of Remote Central will almost certainly recognize the product. You see, Sunwave is a well established “OEM” (Original Equipment Maker) of remote controls, so what they do is design and manufacture products intended to be marketed by other companies. There are several companies in the U.S. selling Sunwave-made remotes under other names and, although some may request a few more customizations than others, for the most part a particular model will operate identically across all brands. We were originally introduced to remotes designed by Sunwave several years ago with the North American-based Crisp Solutions label, and have since reviewed different models. These days Sunwave has started to make inroads into the USA with their own brand name, and recently provided us with their latest and greatest control, the $139 USD MSRP SRC-3810. Next to the impulse purchase category of remote controls – those inexpensive clickers sold in bubble packs that promise the world but deliver somewhat less – mid range products are the most popular, appealing to consumers with an expanded budget and more demanding equipment. So far, all of Sunwave’s remotes would classify as mid-priced, but most did not actually come with mid-range capabilities. They had flashy high-tech designs with touchscreens, bright backlighting and exotic features, but their capabilities tended to fall behind other similarly priced offerings. In particular the promising SRC-8000 (read our review of the identical UCommand 525) had 8 devices, a backlit LCD touchscreen, hard buttons, macros and a lot more, but suffered one crucial limitation: it could only hold a total of 28 commands per device. Take a reasonable requirement of power, volume, mute, channel/chapter, keypad, menu and basic transport commands and you’re already at 28 functions, with no room for anything else. The SRC-3810 may simply look like a UCommand 525 of a different color, but rest assured that under that trendy silver exterior there are significant changes and improvements. In fact, after just a few minutes of using the remote it became quite apparent that Sunwave is responsive to user suggestions: many features and operations have been changed or improved in the new model. More customization, better use of hard keys, and far greater capacity. Could this finally be the compact remote that can do it all?